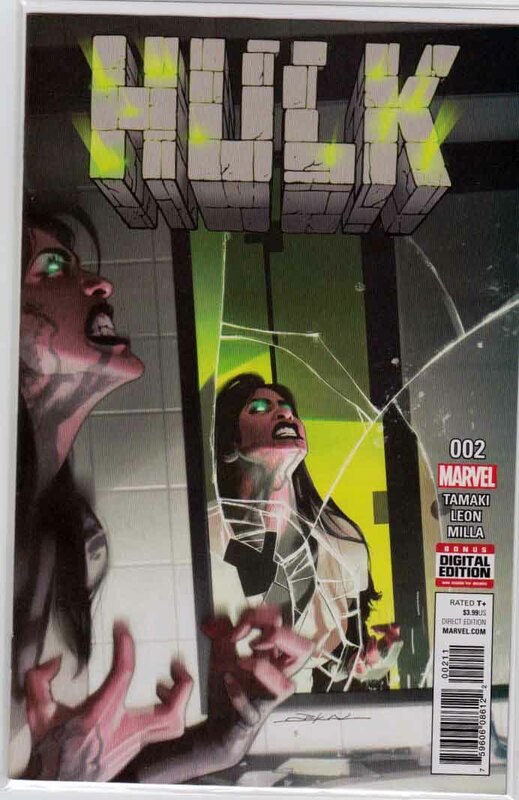 Hulk #1 (2017) Jeff Dekal Cover. Mariko Tamaki Story. Nico Leon Pencils. JENNIFER WALTERS has survived the Civil War - barely - and having risen from the rubble, she re-enters the world a different kind of hero. Fueled by a quiet rage, she is determined to move forward, to go on with her life, but the pain of the past and all she's lost is always there, an undercurrent, a pulse, waiting to quicken and trigger Jen's transformation into the one thing she doesn't have control over. Hulk #1 (2017) Variant Rahzzah Marvel Hip-Hop Cover. Mariko Tamaki Story. Nico Leon Pencils. JENNIFER WALTERS has survived the Civil War - barely - and having risen from the rubble, she re-enters the world a different kind of hero. Fueled by a quiet rage, she is determined to move forward, to go on with her life, but the pain of the past and all she's lost is always there, an undercurrent, a pulse, waiting to quicken and trigger Jen's transformation into the one thing she doesn't have control over. 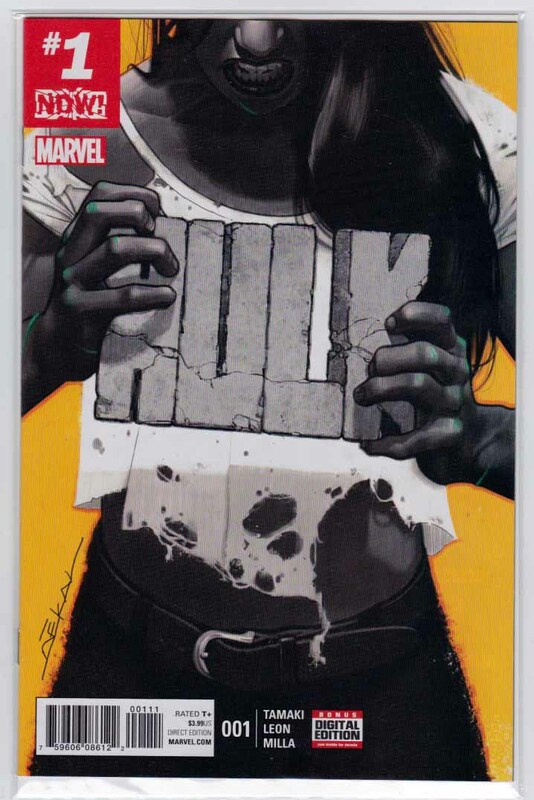 Hulk #2 (2017) Jeff Dekal Cover. Mariko Tamaki Story. Nico Leon Pencils. HOW CAN YOU FIGHT THE MONSTER WHEN THE MONSTER IS YOURSELF? 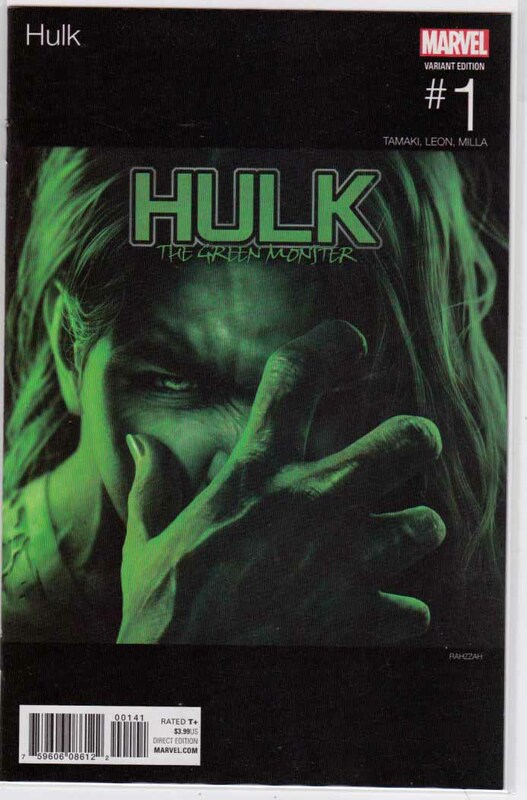 As JEN continues to struggle with the HULK (and anger) within herself, her newest client struggles with her own dark secrets. What happens when a terrified recluse is forced into the world against her will? When fear is pushed into the light? Can Jen reconcile the two halves of herself in time to help her client? 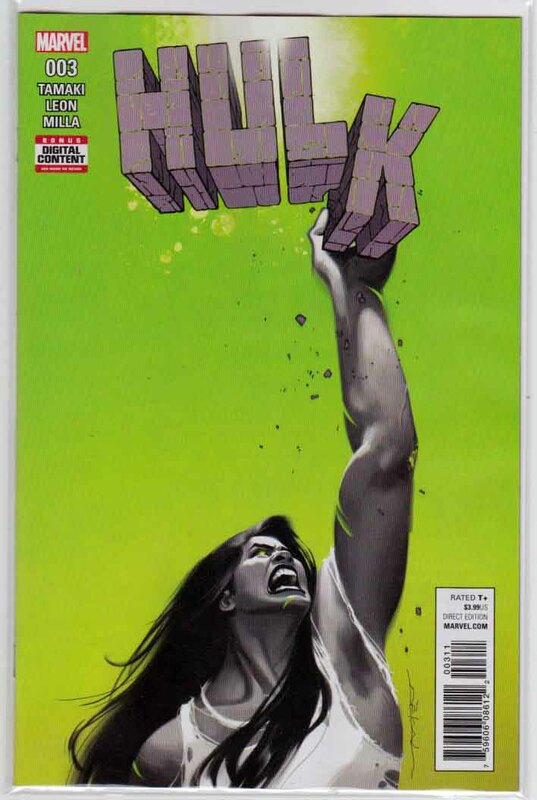 Hulk #3 (2017) Jeff Dekal Cover. Mariko Tamaki Story. Nico Leon Pencils. Jen's life is finally settling into a rhythm: She wakes up, goes to work, helps her new clients, goes home, watches a cooking video, and goes to sleep. But when a murder rocks the life of one of her newest clients, how will Jen react? Is there more to the situation than just Jen Walters, lawyer, can handle? Will she need the HULK to get herself out of this jam? 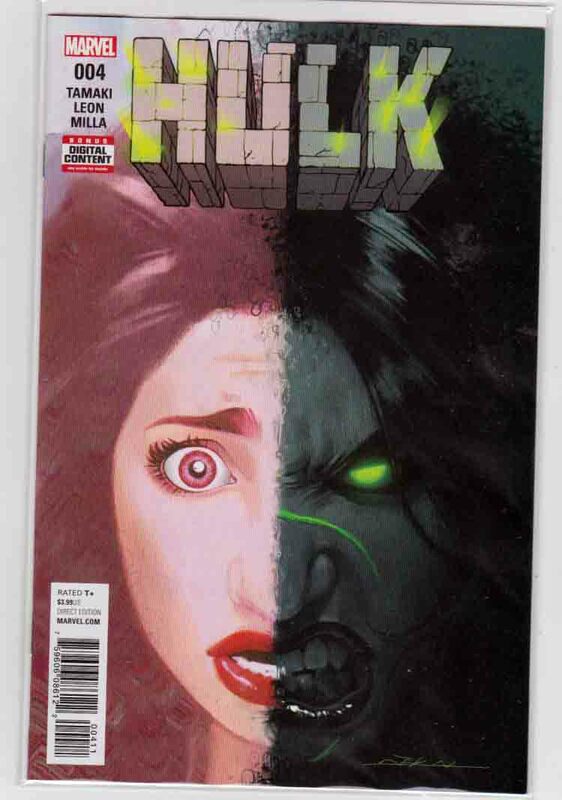 Hulk #4 (2017) Jeff Dekal Cover. Mariko Tamaki Story. Nico Leon Pencils. HAUNTED BY SPECTERS OF THE PAST! Trying to rebuild her own life and law career, JENNIFER WALTERS is determined to help her newest client, MAISE BREWN, a woman on the verge of eviction and a massive nervous meltdown. Once an outgoing yoga instructor, a brutal attack changed Maise's life forever. Now a reclusive shut-in, Maise wants Jen's help. More than that, she wants a promise, that Jen will help her keep her home. And if Jen can't, Maise has another plan, a menacing force of her own. What happens when a fear is so strong, it becomes a destructive force in its own right? Jen is about to find out.